Sofie Dossi on Boss Cheer and her New Apparel Line | YAYOMG! Sofie Dossi is an incredibly talented contortionist, aerialist, influencer, and actress. Since her impressive performance on America’s Got Talent back in 2016, Sofie and her following have exploded! 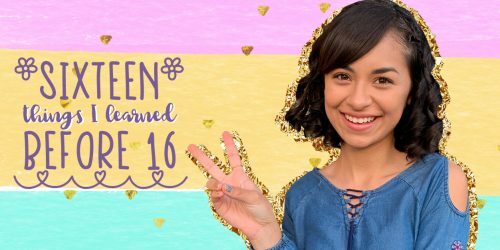 She’s appeared everywhere from The Ellen Show to the RDMA’s, collabed with your favorite creators like Miranda Sings and Rhett and Link, and put on a spectacular performance at VidCon last week. Sofie’s latest endeavor? 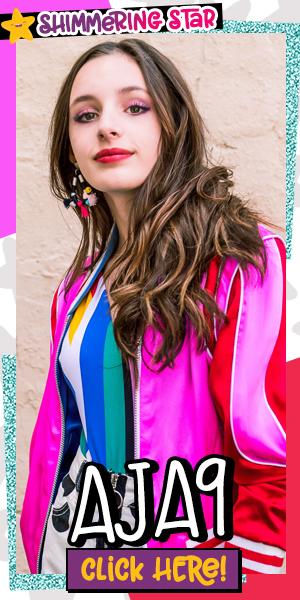 She just landed a role on Brat’s new series, Boss Cheer, where she’s able to bring her talents to life in a whole new way. Sofie also just dropped her new apparel line last week, a collection of clothing and accessories inspired by her motto of leading with your heart and working hard. We’re so inspired by Sofie’s passion and drive! Get to know Sofie Dossi as she dishes on Boss Cheer, her new merch, and all the ways she hopes to inspire her followers to dream big, work hard, and follow their hearts! 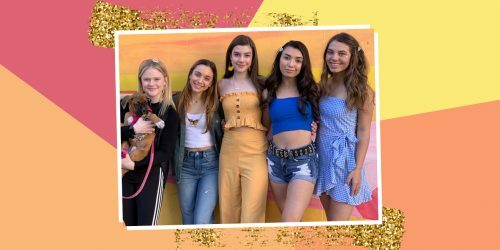 You’re on the new Brat series, Boss Cheer, which just premiered on June 21st. What can fans expect from the series? SOFIE DOSSI: It’s a really fun series about a pair of new cheer coaches who take on an embattled competitive cheerleading team. Can you share a little about your character and role on the show? SOFIE: Danielle is a humble and hard-working character who really wants to get on the cheer team at her new school while trying to hide her poor family life. She has unique contortion abilities that set her apart from the average cheerleader. How have your talents as a contortionist and aerialist helped you in your cheer-focused role? SOFIE: It helped me not be afraid to fly through the air doing crazy cool tricks! What inspired you to get into contortion? What is it about it that you love? SOFIE: I was 12 years old and watching Cirque du Soleil videos on YouTube seeing performers bending and twisting and thought, “Hey, I can do that!” So I kept watching and started to teach myself. I loved the uniqueness of it and how it made my body feel. Back in March, you appeared on Good Mythical Morning. What was it like hanging with Rhett and Link? SOFIE: Rhett and Link are hilarious and so fun to work with. The best part was trying to teach them some contortion! In fact, I just ran into them again and you can find them in a clip in an upcoming YouTube video, releasing June 30th! You already have some seriously impressive skills, but what is something you don’t know how to do that you’d like to learn? SOFIE: I want to learn how to scuba dive! How are you hoping to use your influence and platform for good? SOFIE: I want to continue spreading a positive message through my YouTube videos, but I also am working on connecting with children through motivational speaking at schools encouraging them to act from their heart, work hard, and give back. What has inspired you recently? SOFIE: Recently and always, my fans have always inspired me with their comments about how hard they’re working on what they love. I’m both inspired and so incredibly grateful for them! Your new apparel line just dropped! Tell us a little about working on your new merch. SOFIE: I wanted to start an apparel line that expressed the message that anything is possible with heart and hard work. I was inspired by my experiences of following my heart to do something I loved even though it didn’t make sense to anyone else. I wanted to share with everyone that the strength inside is what makes you strong outside. Amazing things can happen when actions come from the heart and you stay true to yourself. What advice would you like to share with our YAYOMG! readers? SOFIE: Lead with your heart and follow with hard work. Feeling inspired to start following your dreams like Sofie did? It’s Your Universe will help motivate you and help you put together your dream come true action plan!